The first piece of cannabis reform legislation introduced in the 116th Congress is H.R.127-- Compassionate Access, Research Expansion and Respect States (CARERS) Act of 2019. Sponsored by Cannabis Caucus Chair Rep. Don Young (R-AK) and Rep. Steve Cohen (D-TN), this year marks the third time that the CARERS Act has been filed since its first introduction in 2015. The bill includes several provisions: it protects cannabis patients and businesses in compliance with their state laws from federal prosecution; excludes cannabidiol (CBD) from the federal definition of ‘marijuana’; compels the Attorney General and Drug Enforcement Administration (DEA) to license additional medical cannabis cultivators and researchers; and authorizes doctors in the Department of Veterans Affairs to recommend medical cannabis to veteran patients in-line with respective state law. Since this bill contains changes that fall within multiple Congressional committee jurisdictions (Energy and Commerce, Judiciary, and Veteran Affairs), it faces a more challenging path to becoming law than more narrowly focused bills. However, every element of the bill has proven bipartisan support and represents sensible steps that fall short of rescheduling or legalization. The reality is that cannabis prohibition and prejudice has infiltrated so much of the federal code that it will take many clear and forceful laws to root it out completely. The CARERS Act would fulfill several immediate needs of national cannabis reform such as enshrining certain protections for legally compliant individuals and businesses dealing with medical cannabis. The bill reads that “the provisions of this title relating to marihuana shall not apply to any person acting in compliance with State law, as determined by the State, relating to the production, possession, distribution, dispensation, administration, laboratory testing, recommending use, or delivery of medical marihuana.” This section expands upon the intent of the previous Rohrabacher-Blumenauer amendment, which stops the Drug Enforcement Administration (DEA) from spending money on prosecuting sanctioned state-compliant individuals and businesses who possess or work with medicinal cannabis. Another major aspect of the bill would remove some of the considerable roadblocks to approved cannabis research. By mandating that the Department of Justice issue new federal cannabis cultivation and research licensing, the bill would end the monopoly on research cannabis production currently enjoyed by the University of Mississippi. It would also increase both the supply and quality of cannabis available to researchers while simultaneously expanding the pool of licensed scientists and doctors authorized to conduct that research. At first glance, removing CBD from the definition of ‘marihuana’ in the Controlled Substances Act (CSA) seems duplicative since industrial hemp (Cannabis sativa L.) was removed from the CSA by the most recent Agricultural Act (Farm Bill). Additionally, the DEA, after dismissing recommendations from the Food and Drug Administration (FDA), placed Epidiolex—a proprietary CBD medication derived from cannabis—on Schedule V, the least restrictive category. As a result, the legal status of CBD is still not completely settled. Going a step further and explicitly excluding CBD from the CSA would eliminate any remaining questions about its legal status and fully enable researchers to explore the substance in depth. The final element of the CARERS Act is a provision that has existed in several forms since 2015. The language of what has previously been called the Veterans Equal Access Act and amendment is included in the bill. 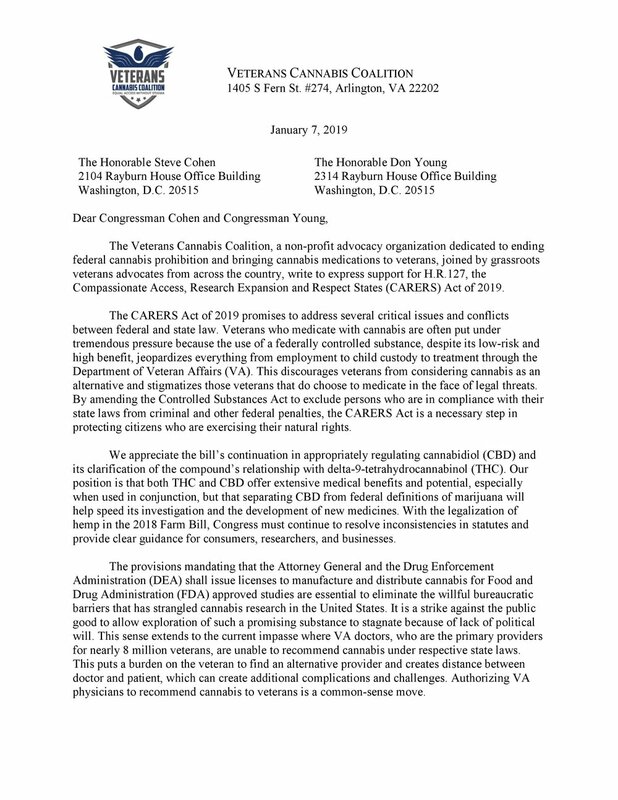 It states that the Department of Veteran Affairs (VA) shall authorize physicians to "provide recommendations and opinions to veterans who are residents of States with State marijuana programs regarding the participation of veterans in such State marijuana programs and complete forms reflecting such recommendations and opinions.” This is something that veterans in states with medical cannabis programs have been demanding for years, since millions of veterans rely on the VA for their primary medical care. Allowing veterans and their doctors to honestly discuss the risks and benefits of cannabis use is necessary to improve communication and care planning. 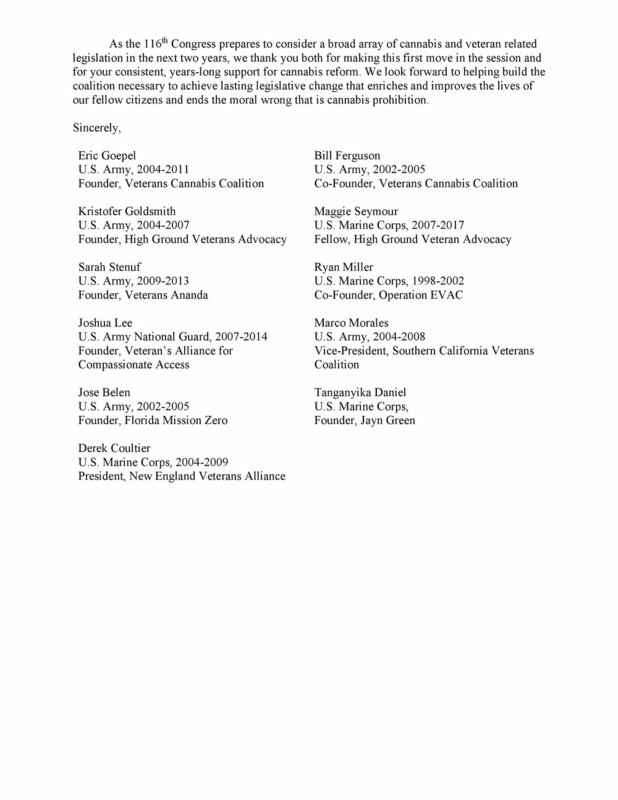 The Veterans Cannabis Coalition is joined by veteran advocates from across the country in supporting this effort at broad reform, including: Southern California Veterans Coalition, High Ground Veterans Advocacy, Veterans Ananda, Marine Qweenz, Operation EVAC, New England Veterans Alliance, Florida Mission Zero, and Veterans Alliance for Compassionate Access. The Veterans Cannabis Coalition is a non-profit advocacy group founded by Iraq War veterans with the goal of ending federal cannabis prohibition and ensuring equal access to medicinal cannabis for veterans and all Americans.